On Easter Sunday, I took a trip to The Park on 10th Avenue (at 18th Street) on the West Side. Although there was no Easter Egg hunt, there were still plenty of eggs to be found including some surprising places. We arrived at The Park and immediately ordered the first of many rounds of drinks. 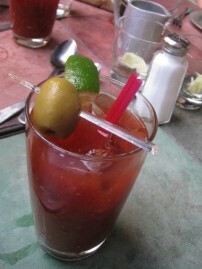 Mimosas, Bloody Marys and pints of beer were popular in addition to a round of shots of Patron. This was a holiday after all. Upon delivery of the drinks, I was more focused on acquiring a saltshaker than listening to the specials. It should come to no surprise that as soon as I heard “white pizza” I tuned out. I heard the server mumble along “…eggs and bacon…” I figured this was a separate brunch special. Needless to say, I was mistaken and before I could even comprehend what I thought I heard, a white “breakfast pizza” with mozzarella, eggs and bacon had been ordered for our table. The regular brunch menu was quite impressive in its own right. In addition to classics such as Eggs Benedict (an I Heart Brunch staff favorite), Challah French Toast and Huevos Rancheros, they had intriguing offerings such as Crab Cake Benedict, “Tinga” Benedict (with shredded chicken and dill sour cream), chicken and waffles, and Ricotta Pancakes with Orange Mascarpone Marmalade. I decided to go with the classic Eggs Benedict, knowing full well I would regret not getting it after seeing an order placed in front of one of my brunchmates. A couple Bloody Mary’s later, the pizza arrived and it immediately blew my taste buds away. Unlike the Easter Bunny, I never once in my life believed something this delicious actually existed. I mean, it contained only ingredients I love (cheese, eggs and bacon), yet I never even thought about them working on a pizza crust. But believe me, it absolutely works. 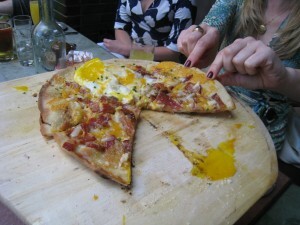 The egg yolks were runny, acting as a bright pizza sauce, and the bacon was crisped to perfection. It was simply amazing. A few more drinks later our main course had arrived. As soon as the Eggs Benedict was placed in front of me, I knew I had made the right decision. The eggs were perfectly poached, the ham was supreme and the English Muffin was delightfully toasted. The highlight, however, was the smooth, flavorful Hollandaise, which I also used as a dip for the slightly crispy home fries. 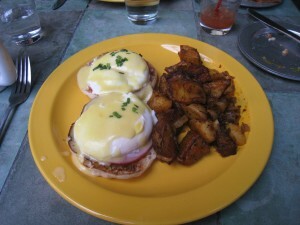 The real shame here is that arguably the best Eggs Benedict I have ever eaten was overshadowed. Although I can hardly be upset as The Park’s “Breakfast Pizza” is truly a culinary sensation.